In June, I hitchhiked from Athens to Berlin to write about the Balkan Route — the route that saw hundreds of thousands of refugees traveling north last year, but which this year has been progressively blockaded by militarized police and razor-wire border fences. My last post was about the “transit zone” between the Serbian and the Hungarian fences. Because undocumented migrants can leave Serbia but cannot enter Hungary, they have been stopped in this non-place where they have erected a small, destitute camp. 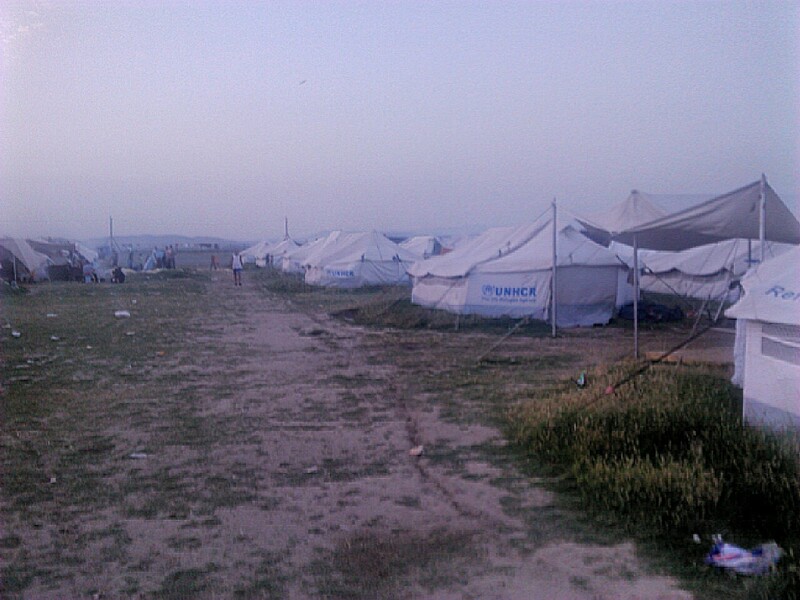 I visited the crossing at Kelebjia, Serbia, but there was another camp several kilometers east at Horgos. I asked people there why they sleep inside of the transit zone without showers, without running water, sometimes without a tent, and the answer always referenced “the list” — a rolling register that migrants could put their name on and hope for admittance into Hungary, which takes in only 10 to 20 asylum seekers daily. How exactly this list worked and why you had to be inside the transit zone to remain eligible was never explained to me. Neither the residents nor the aid workers knew the details, and I began to doubt that the Hungarian government knew either. Everyone played their own role intuitively, it seemed, and yet no one knew what the hell was going on. I heard her speaking English, which made it easier for me to introduce myself. Her name was Ruby, she was from Cuba and she was hoping to reach Spain, where much of her family lives. She’d first flown to Moscow and then to Montenegro because Cubans don’t need a visa to visit either country. From Montenegro, she’d crossed into Serbia, because Serbia’s borders are open. I don’t know how else to say it: Ruby doesn’t look like the other women at the camp. Tall, Afro-Carribean, dressed in pre-torn jeans and Mini Mouse tank top, she draws long silent stares every now and then from the others waiting around the little fruit stand near the border. “It’s awful here,” she said, glancing repugnantly at the giant brown puddles stretched across the gravel road where the aid workers’ vehicles park. Lunch distribution was over, but another van had pulled up and a young man emerged with a box of stainless steel nail clippers. He handed out about fifteen of them, and the simultaneous clipping sounded like grasshoppers at high noon. Ruby had arrived 20 days ago at the transit zone, she’d put her name on the list, and now she was waiting. Other people who had arrived after her had already been called on and were gone into Hungary. She didn’t know why she was still waiting, but she thought it was because she is a Cuban asylum-seeker and not Syrian or Afghani. The amenities inside the transit zone camp — if you can even call them amenities — are austere. No showers, fewer tents than people, very little shade, nothing but the dirt to sit on. But, for Ruby, the primitive camping has a second dimension of brutality. The men and the other women residents wash themselves from buckets in semi-privacy near the camp. Ruby attracts too much attention to abide semi-privacy. She has tried to walk deeper into the woods to wash up and men have followed her in there “to look at me,” she said. Once, in camp, an older man told her he knew a place where she could shower in private. She was surprised at the generous offer and followed him into a tent, where, once inside, he put his hands on her. She ran out. She’s alone, but not totally alone. She met another Cuban named Joe en route to Kelebjia and they became travel companions. He’s someone to talk to, they joke around in Spanish, make arrangements to go into town, to watch each other’s things. And when Joe is with her, the men in the camp leave Ruby alone. When he’s not there, she usually stays in her tent most of the day. I hung around the fruit stand for several hours watching aid vans come and go, children chasing each other around the gravel, young men negotiating for a socket at the phone charger hung up at a kiosk near the fruit stand. Later in the day Ruby and Joe fell into a serious discussion. Another camper in the transit zone, an Iranian man, was also involved. They spoke to each other in English, but I didn’t eavesdrop. Later I asked Ruby what was up. “They want to go with the mafia,” said Ruby, indicating Joe and the Iranian. The “mafia” is how asylum seekers refer to smugglers who charge money to take them across borders. 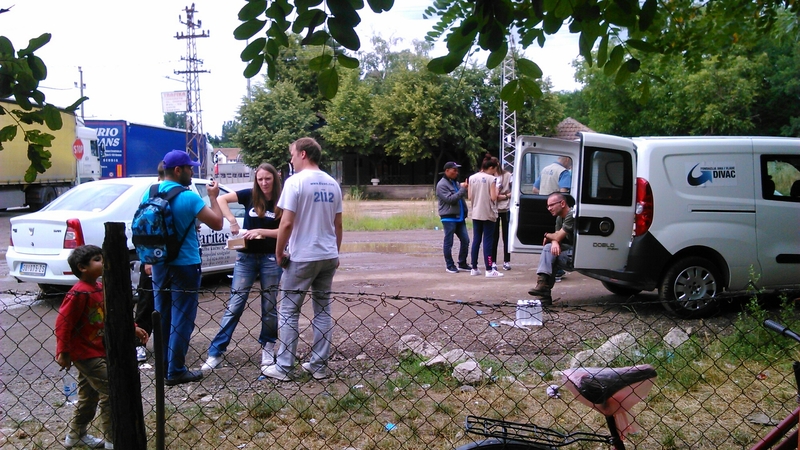 Ruby (left) and Joe (right) at the aid distribution location in Kelebija, Serbia. By the time I left, nothing had been decided. The question was put off for perhaps another day or two. I sat on the curb waiting for the bus back to Subotica and watched Ruby and Joe standing on a dry patch in the road between two puddles, singing in starts and spurts to piece together a Spanish song. When the tune came back to them in full, they laughed and joined hands, began dancing the salsa. Their dance was short, not long enough for me to dig out my camera and record it. Just long enough to put a looping scuff in the dirt. For the past two weeks I have been traveling the Balkan Route, which migrants take to get from the port of Athens to points north. I’ve been meeting refugees and the people who help them. 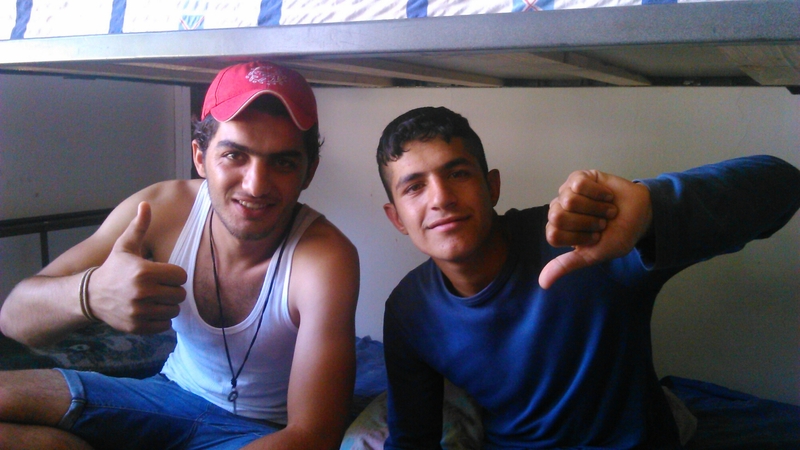 In this post, I visit a “transit zone” camp between Serbia and Hungary. A closed border, all razor wire and gloom. And, running through the heart of it, is a road where every now and then a car rolls through, full of luggage and kids with their feet on the back of dad’s head-rest, and maybe one of them slowly turns their head to interpret what they’re seeing: Ragged tents with the poles pierced through shredded nylon; an old man shaving over a puddle; two kids running circles around a Red Cross van. I had thought the mood would lighten the further north I traveled. I was now at the top of Serbia in Subotica, the last town before Hungary, and Hungary was the last barrier to the wealthy West: Austria, Germany, Sweden! But that assumption left out an important point: Hungary knows this. Viktor Orban, the prime minister, has said candidly that he doesn’t want more Muslims in his country, and Hungary’s policy toward migrants has reflected that: They’ve reduced the number of asylum centers, given border police more power to “push” migrants back into Serbia. Even when asylum-seekers enter the country legally, Hungary detains them, sometimes for several months. So the Serbian border has become a kind of trench where people walk around biting their nails, making small talk, taking showers, preparing for the next step. When I arrived, I had no contacts. I’d tried asking around in Belgrade for a phone number or even a name, but border volunteers shift from place to place and are difficult to get in touch with. Besides, the word among volunteers in Belgrade is that there’s nothing for the public to see. Neither journalists nor aid workers can get into the camps at the border without permission from some minister or other. At first I didn’t understand this. The Serbia-Hungary border has unofficial camps as well as official ones, and I couldn’t imagine who could stop civilians from getting into an unofficial camp. It’s just tents in a field, after all. That’s because I didn’t understand the “transit zone.” People had tried to explain it to me. I knew what it was in theory, but I didn’t believe it until I saw it. The transit zone is the space between the Serbian fence and the Hungarian fence. It doesn’t belong to either country. It’s not really a place in any sense of the term. Even with the best passport in the world you cannot visit a transit zone. You cannot stop in a transit zone. The only thing legally sanctioned in a transit zone is transit. So you have to keep moving toward the Hungarian passport control station. A few years back, I was fixed on a French word — debrouillard — which describes a person who can literally clear the fog, figuratively solve the little hang-ups that ruin plans. If you’re traveling with a debrouillard and you miss your train, somehow you’ll arrive at the next city before the train does. I don’t know how. Maybe they’ll talk to the ticket booth attendant and the attendant will drive you personally to where you’re going. There’s no straight lines in a debrouillard’s life, though. The rule is, they never catch the train. They’re always one cent short, and then they get the meal for free. When I met Mohammed at the Miksališta center for refugees, I could tell he was of this tradition. Since June 14, I’ve been traveling from Athens to Berlin and writing about refugees and the people who help them get where they want to go. In my last post I wrote about Macedonia, a hostile country refugees have to cross as quickly and quietly as possible. Serbia is a good place to rest. Although the country is surrounded by closed borders, it’s own borders are open. That means once refugees enter Serbia, they can stay, they can buy bus tickets to other points within the country, they can rest up for their trip north. Almost everyone I talked to was heading north, to Vienna, to Switzerland, to Germany. 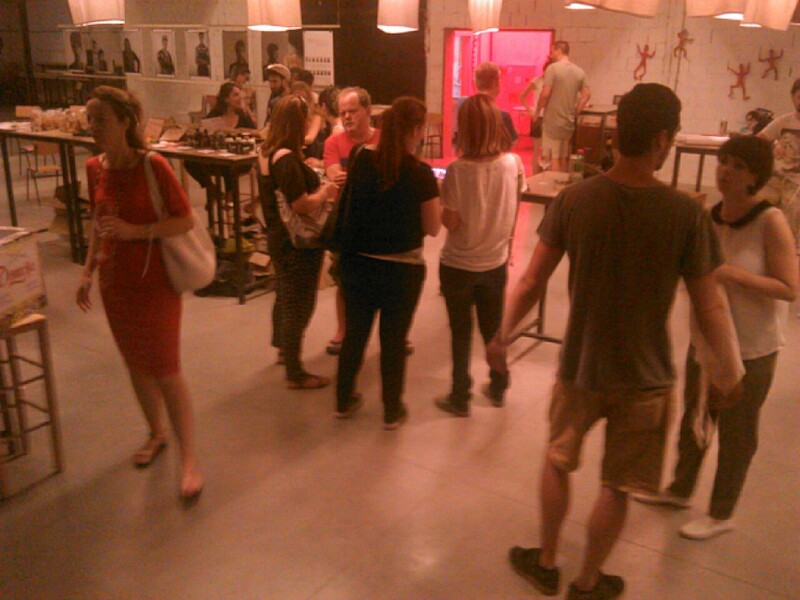 When I arrived in Belgrade, the capital of Serbia, there was an event at a bar/art space where refugee helpers were going to share stories and strategies. It was a glimpse into the world of humanitarianism, and I learned two things: There are too many NGOs in this world to keep track of; and people working on the ground tend to look askance at the people in charge of the money. A row of unframed black-and-white photos in a hall, hanging next to a bar, finger food, people in little clusters, chatting. I was looking for Elise, the German woman from Refugee Aid Serbia who had invited me, but I didn’t know what she looked like. I went over to the photos, read the artist’s statement: “Older Syrian men are a pleasure to photograph…” I suppose the series of portraits intended to make refugees appear human to the people who only see refugees depicted in photographs. Since June 14, I’ve been traveling from the south coast of Greece toward Berlin, writing about migrants and migration facilitators — the people who help migrants get where they want to go. 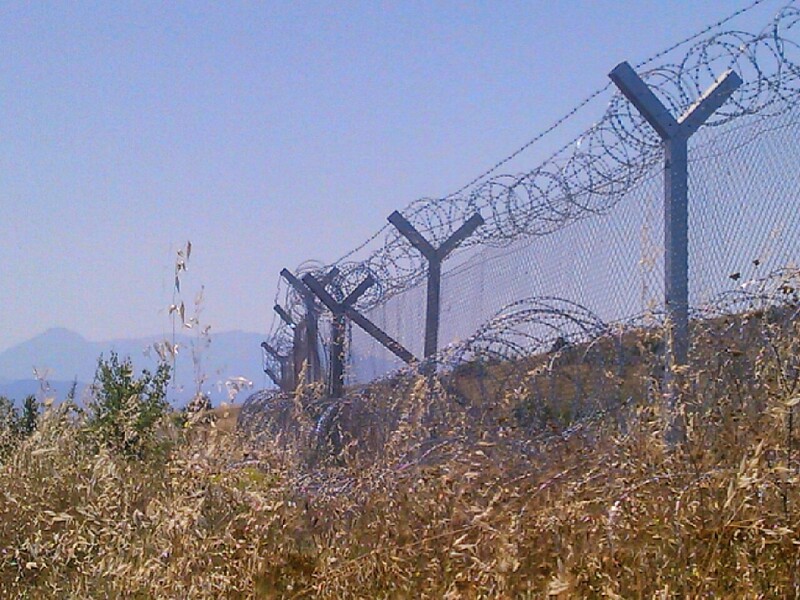 My original idea was just to post this photo (above) of the Greek-Macedonian border near Idomeni, and that was going to be my entry on Macedonia. It was going to be a statement about what this little country represents to undocumented people who want to pass through. But then I thought I would add some facts to make the image hit home. On March 9, the former Yugoslav republic of Macedonia closed it’s borders to refugees, from then on out hunting down tresspassers throughout the entire country and forcing them back to the border. They beat people, kick them, break their arms with clubs, teargas them, push them into razor wire — these are the stories I’ve heard. Polykastro, a Greek town near the Macedonian border with about 7,000 residents was the link to civilization for over 10,000 refugees holed up in massive unofficial camps in the area (Idomeni is 15 minutes away) before they were cleared in the last month. And the town was also a link to civilization for as many as 1,000 volunteers who had come in from all over the world to help mitigate a crisis that all the countries of the United Nations have been somehow unable to deal with. Now that the unofficial camps have been closed, the number of refugees in the area has dwindled and so has the number of volunteers. But Polykastro is a different place now. This is Part Three of the story. For Part One, click here. For Part Two, click here. This is not a portrait of a quiet Christian town without a history, suddenly tossed into the stream of the real by current events. 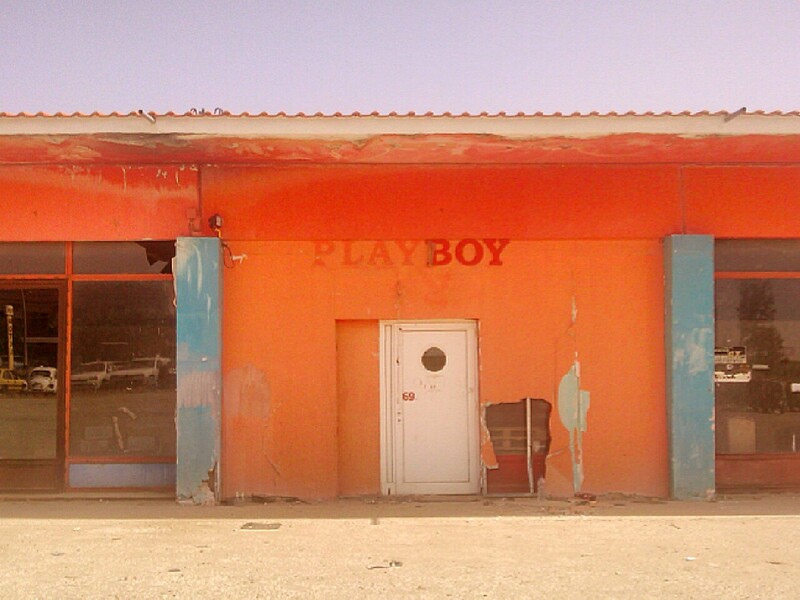 Every town has a history, and if it doesn’t then it will soon. Polykastro is indeed quaint, it’s monuments sit in empty parks, grass crawling up their legs. There’s a football field and a dozen ice cream parlors. Most people you’ll meet on the street are ethnic Greeks, if that means anything. But in 1900, this was part of the Ottoman Empire, there were more Muslim Turks than Christian Greeks, and the Muslims were the ruling class. Then they fought some local battles, then the Empire collapsed. Bit this is a portrait of a small, shrinking town, suddenly changed again, if only temporarily, by the massive refugee camps — Idomeni and Nea Kavala — that were pitched in fields nearby. This is the second part of my visit to Polykastro, Greece, a small town transformed by the refugee camps in the area. “What are you doing here?” Alaa asked me inside the lobby of the Park Hotel. I had talked to a lot of people at the Park Hotel — a hang-out for residents of the nearby Nea Kavala refugee camp — but I hadn’t talked to him. A lot of people had just come up to me to make small talk. Alaa seemed somehow too serious for that. Not cold, but serious. I found myself sitting next to him at the coffee table under the TV, and I had said hi first. “I’m writing a blog about the situation of refugees and volunteers,” I said. Later that evening, around 8 p.m., I saw him again and smiled. “So, do you want to see our camp?” he asked. He knew and I knew that journalists could only get into the official military camps if they were invited by the Greek government. I didn’t have the time to visit the parliament. But since I’m writing about the difference between official and unofficial camps, I was certainly interested. When the Greek government cleared the massive unofficial camp at Idomeni in late May, they moved as many people as they could to official military-run camps, usually far outside cities and away from borders. But it’s hard for journalists to get in, and not a lot has been written about conditions at these places.